This 187-acre property located in Hendry County stretches along a particularly attractive one-mile bank of the Caloosahatchee River and a large oxbow. Easily accessible to Southwest Florida’s coastal communities and downtown Fort Myers. Murphy’s Landing is just minutes from historic LaBelle, Florida. The property is entitled for 890 units and 50,000 square feet of commercial space. On the recently widened S.R. 80, approximately 15 miles east of I-75 exit 141; within 45 minutes of Southwest Florida International Airport, Florida Gulf Coast University and downtown Fort Myers; within 10 minutes of LaBelle, a quaint, history-rich riverfront community with small-town charm. 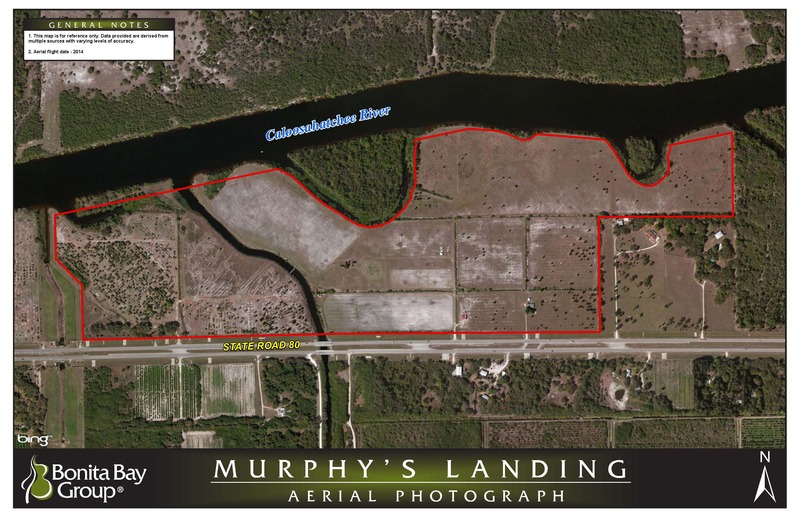 Bordered on the west by vacant Lee County property, on the north by the Caloosahatchee River, on the east by a mix of single-family and vacant properties and on the south by SR 80 with a full median opening. PUD, allowing for 890 residential units and 50,000 square feet of commercial uses. Zoning is consistent with the Future Land Use Designation “Residential-High Density”, allowing up to six single-family units per acre and ten multifamily units per acre. The South Florida Water Management District (SFWMD) has issued a Conceptual Permit along with a current Consumptive Use Permit. There are no COE impacts proposed and a “no permit required” letter has been issued. Two gopher tortoises have been identified and a relocation permit has been issued by the FWC. Both Phase I and Phase II environmental audits were conducted when the land was purchased. Based on the audits, there are no environmental impediments to development. Bonita Bay Group has planned its own utility service to provide water and sewer to Murphy’s Landing as it lies in an area of Hendry County not presently served by the County. The utility plants are planned for the south side of S.R. 80 on property zoned for such use. Permitting of the property with South Florida Water Management District (SFWMD) and FDEP is complete for both water and sewer plants. SR 80 currently has capacity to absorb traffic generated by the allowed uses on this property.